In India, the dentistry program is for 5 years. Entrance to the program depends on results of the common entrance tests or its equivalent. The students should be good in their academics to enter into dentistry. There is limited information on the career choices of students in developing nations, with few studies investigating career motivations of an Indian population, and hence the study was conducted to determine the motives and perceptions of dental students. To determine the motives and perception of dental students, attending Dental Colleges in Bangalore city. List of Dental Colleges in Bangalore city was obtained from the Rajiv Gandhi University of Health Sciences website. Sixteen dental colleges were present. All the colleges were considered for the study; the study group included both undergraduates and post graduate students. Of 16 dental colleges, the present study was conducted in 15 Dental Colleges of Bangalore city as one college did not permit to conduct the study in their premises reasons best known to them. The required permission to carry out the study was taken from the Principals of all the Dental Colleges in Bangalore. Informed consent was taken from the participants to carry out the study. Based on the results of the pilot study, some minor modifications were done in the proforma and the sample size was calculated to be 600. Study population in the survey included 600 participants (under-graduates and postgraduates) from all the 15 Dental Colleges in Bangalore city. Stratified random sampling was done based on the year with 100 students from each year selected from the 15 dental colleges. The students were randomly selected by taking their consent on first come basis. Each of these students was asked to complete questionnaire in the college and was retrieved immediately. It was made clear to them that the identity would not be disclosed, and they were requested to give their frank opinion. Development of the questionnaire was based on the items previously reported in similar studies. ,, Since the initial instrument had already been pretested and was refined using a similar group of dental students in the previous studies. ,, We administered the same pretested questionnaire. The proforma consisted of two parts. The first part included the general information like age, gender, education, and year of study. The second part consisted of close-ended questions based on previous studies, ,, with some additions related to cultural and family influences. It consisted of 25 questions, question 1-8 were yes or no questions. For questions 9-23 candidates were asked to score the influence of certain factors (Factors like financial rewards, caring profession (helping people), security, status, nature of occupation, self-employed) on their decision to select dentistry as a career on a scale (Likert scale) from 1 to 9 in order of increasing importance. Question no. 24 and 25 were multiple choice questions. There was also an opportunity for free comment [Table 1]. Data were analyzed using the SPSS package version 15 was manufactured by IBM corporation 15. Kruskal-Wallis test was used to find out the level of significance. Mann-Whitney test was used to find a significant difference among pair of groups. Factor analysis was carried to group motives into related clusters. The difference was considered as statistically significant if P < 0.05. Among the 600 subjects, 210 (35%) were males and 390 (65%) were females [Figure 1]. For 233 (38.83%) participants the first choice was dentistry. High positive response was received (94.33%) regarding Dentistry a Caring Profession. About 410 (68.33%) had heard about dentistry as a career in high school, whereas 388 (64.67%) heard about dentistry as a career in college. 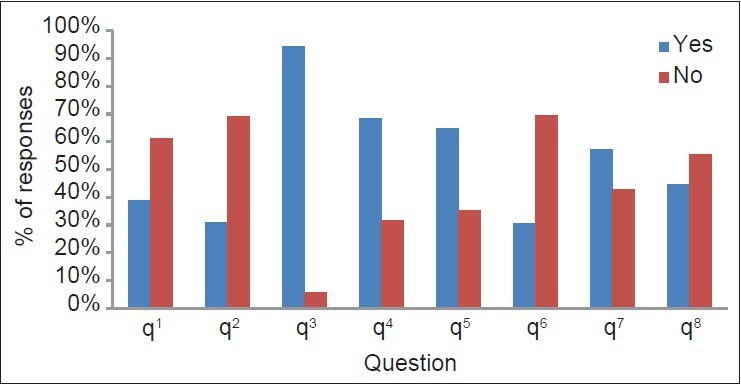 This was the Responses received for Q1 to Q8 across the study sample [Figure 2]. Factor analysis was done for Q9-23. After the factor analysis, 15 questions were grouped under five factors. 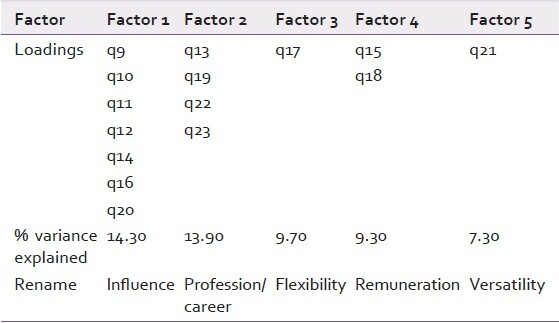 Factor 5: Versatility - represents the opportunities for a dentist in different fields without specialization, Q-21 got loaded here where 7.30% of the information was explained [Table 2]. Postgraduates showed high positive response (24.03%) to do private practice; 17.90% of undergraduates opted to do higher studies and 25.93% of interns wanted to change their profession. 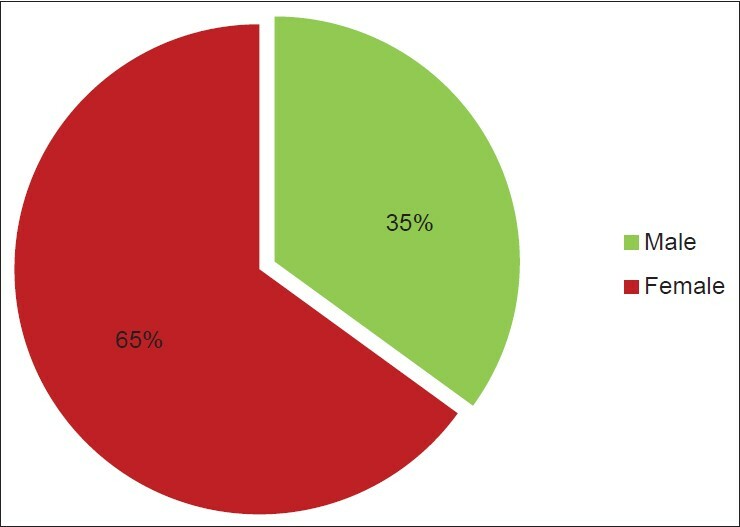 This was the responses received for Q24 across the study sample [Figure 3]. 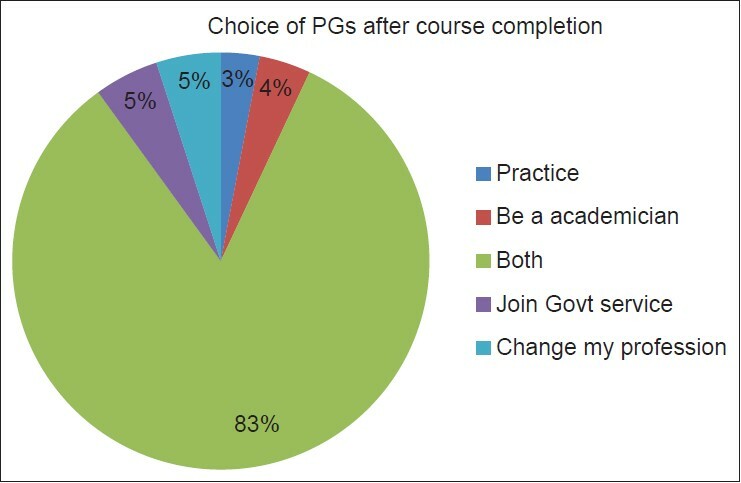 About 3% wanted to practice, 4% wanted to be an academician, 83% wanted to do both 5% of them wanted to join government service, and 5% of them wanted to change the profession.this was the Responses received for Q25 across the study sample [Figure 4]. Q17: The difference in agreement scores was found to be significant among the students in different years of dentistry (P < 0.05) [Table 3]. Factor analysis was carried out and resulted in five factors that accounted for 55% of the variance in the agreement items. Factors 1-3 accounted for 39% of the variance. These factors are used to cluster motives and perceptions which are important factors for choosing dentistry as a career. Private practice that is a common motive for choosing dentistry in many studies appears not to be an easy option because of financial constraints. ,,, In this study the motive for choosing dentistry was to do private practice, the percentage increased from 1 st years (14.29%) to postgraduates (24.03%). In this study, nearly 5% of the students wanted to change their course. This is quite unfortunate given the time, resources and energy that had been invested by both the students and the educators. These students may subsequently need to pursue other careers or make do with dental practice, which may result in a degree of job dissatisfaction and stress. However, we may still need to go further by incorporating interactive sessions that would seek to know the mindset of potential students. In this study, 83% of postgraduates wanted to do both private practice as well as be in academics for better financial security and to share the knowledge gained during their postgraduation. The present study reflects a profile of dental students and their responses to a questionnaire probing the motives for their career choice. It is concluded that for choosing dentistry as a career, "caring profession," "job security," "flexibility," "self-employment" and "prestigious profession" were found to be important motivating and perception factors. About 38.83% students indicated that dentistry was their first choice of career. Hence, we would like to suggest that guidance and counseling of high school and college students to visit dental clinics are desirable and it may be a good idea to establish educational programs in colleges to educate students on their career choice and employment opportunities, so that they can choose the right career. Exposure to dental training appears to improve the perception of the students about dental practice. A curriculum structured to expose the students to core dental courses earlier in their training may, therefore, enhance the perception and acceptability of dentistry to the students. Teaching staff in addition to teaching the technical aspects should communicate their own passion for the profession. They should also help students to understand the objectives of dentistry and make it easier for students to succeed and become dentists. Dental teachers remain a critical factor in motivating students in the decision process of pursuing dentistry as a career. Bernabé E, Icaza JL, Delgado-Angulo EK. Reasons for choosing dentistry as a career: a study involving male and female first-year students in Peru. Eur J Dent Educ 2006;10:236-41. Jover M, Doudoux D, Deveaux E. Representations of the dental surgery profession and the motivations given by second-year French students for applying for dental surgery. Eur J Dent Educ 2006;10:2-9. Al-Bitar ZB, Sonbol HN, Al-Omari IK. 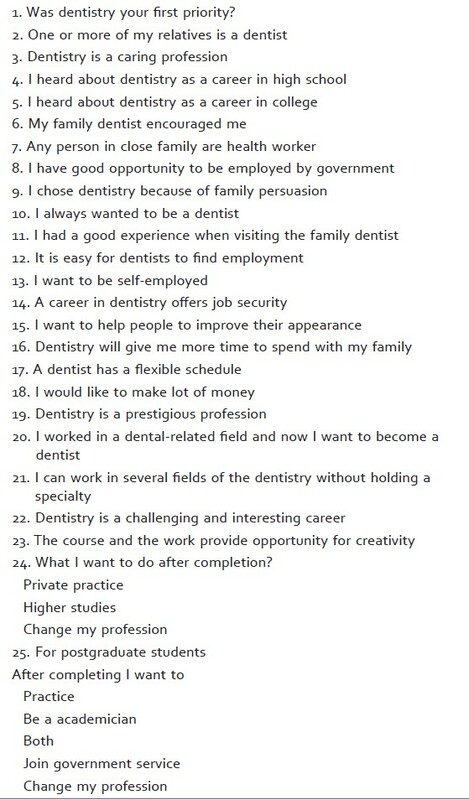 Reasons for choosing dentistry as a career by Arab dental students. Eur J Dent Educ 2008;12:247-51. Brand AA, Chikte UM, Thomas CJ. Choosing dentistry as a career - A profile of entering students (1992) to the University of Sydney, Australia. Aust Dent J 1996;41:198-205. Gallagher J, Clarke W, Wilson N. Understanding the motivation: A qualitative study of dental students' choice of professional career. Eur J Dent Educ 2008;12:89-98. Hallissey J, Hannigan A, Ray N. Reasons for choosing dentistry as a career - A survey of dental students attending a dental school in Ireland during 1998-99. Eur J Dent Educ 2000;4:77-81. Sofola OO, Uti OG, Akpene OI. Does exposure to dental education change the perceptions of Nigerian students to dentistry as a profession? Eur J Dent Educ 2008;12:159-62. Hawley NJ, Ditmyer MM, Sandoval VA. Predental students' attitudes toward and perceptions of the dental profession. J Dent Educ 2008;72:1458-64. Karibe H, Kawakami T, Suzuki A, Warita S, Ogata K, Aoyagi K, et al. Career choice and attitudes towards dental education amongst dental students in Japan and Sweden. Eur J Dent Educ 2009;13:80-6. Scarbecz M, Ross JA. Gender differences in first-year dental students' motivation to attend dental school. J Dent Educ 2002;66:952-61.